Ganga is the most holy river and revered by Hindus since past several thousand years originates from Gomukh Glacier. 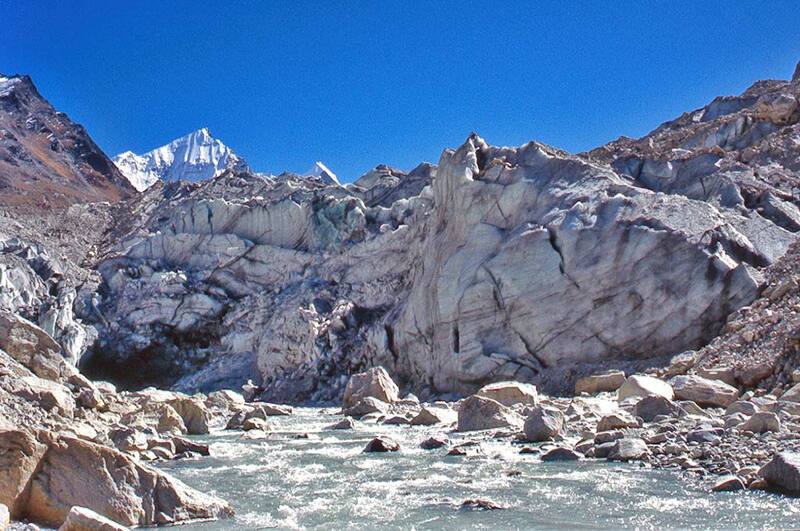 It's a 8km x 24km wide glacier which is the source of Bhagirathi which joins Alaknanda at Devprayag to form Ganga. From Devprayag the river flows 2480 kilometers to Bay of Bengal. It's the most holiest and ancient of rivers according to Hindu Religion. According to the legend, Godess Ganga was the daughter of the sacred mountain Meru use to reside in heavens. Once King Sagar lost 60,000 sons whose tormented souls could be only pacified by the sacred waters of Ganga. Many of the descendants tried to please Ganga but it was only Bhagirath who after severe panache was able to convince Ganga to flow towards Earth. However, the flow of Ganga was so severe that only Lord Shiva himself could control it, so upon request and meditation of Bhagirath, Lord Shiva hold Ganga in his matted hair thus controlling her flow down to earth. Thus Bhagiratha led the way to the ashes of his ancestors and the river cleansed them by its divine waters and later forming an Ocean. The spot is marked as Sagar Island where Ganga flows into the Bay of Bengal. Since then after cremation Hindus pour the ashes of their dead loved ones in Ganga's holy water to cleanse their souls. 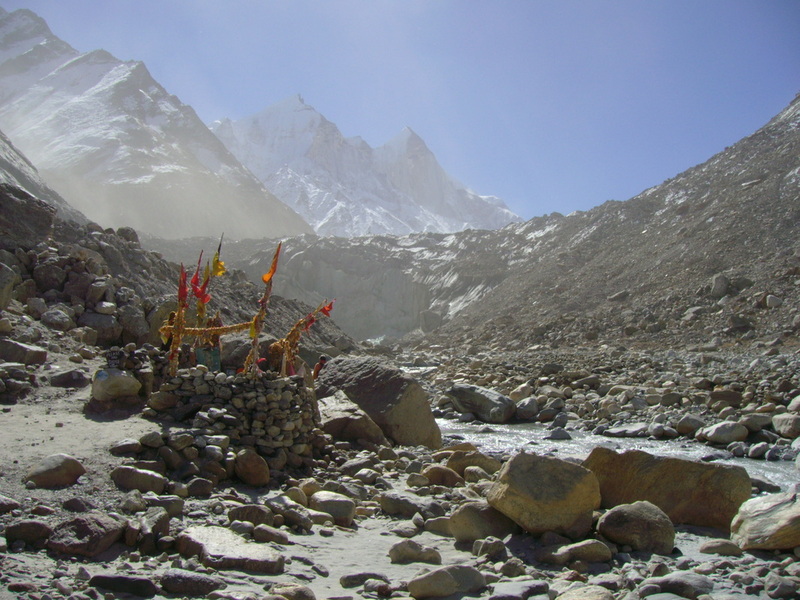 The trek to Gaumukh is been revered by Hindus and is undertaken by hundreds of pilgrims every year. It's a once in a lifetime opportunity for many to cleanse their souls from origins of the Holy River. The Trek from Gomukh to Tapovan is tough as we trek across the glacial moraine upto the huge meadow beside Mount Shivling. As only 150 people are allowed by the Indian Govt. to trek to Gaumukh each day, it's advisable to make an advance booking and mandatory registration way ahead to avoid discomfort. The route and details of Haridwar and Uttarkashi are mentioned well in Dodital and Yamunotri Trek. Please refer for a better understanding about this route and significance of the Holy Cities. Gangotri is situated at an altitude of 3050 meters and is 95 kilometers from Uttarkashi, and 285 kilometers from Haridwar. Gangotri has many small hotels and rest houses and a temple where people come from all over India to offer prayers as Gangotri is one of the Char Dhams of Uttarakhand along with Badrinath, Kedarnath and Yamunotri. Doing Char Dham (4 Pilgrimages) is essential thing to do for a Hindu before he dies and has a deep spiritual significance for Hindus since ancient times. From the temple, the trail passes on the true right of the valley where concrete steps are laden to mark the entrance of Gangotri National Park and sign promoting the works of Himalayan Enviornmental Trust. It's a well marked trail with milestones defining kilometers. Their are places to rest and eateries midway at Rajghat (3250 meters) sitting atop a tributary which flows into the valley. Beyond Rajghat we can savor fine views of Bhagirathi Peak (6900 meters). There will be more eateries as we head towards Chirbasa marking the trail. Their is a plantation of thousands of spruce, silver fir, blue pine and cedar saplings planted by an NGO. We camp at a sheltered campsite at Chirbasa while enjoying the beautiful views. Above Chirbasa the valley widens and offers views of the snow clad peaks of the south. It's a gentle walk to Bhojbasa (3800 meters) with fine views of Bhagirathi and surrounding Peaks. An inspiring panaroma unfolds, including the huge dimensions of Bhagirathi Range and Shivling (Matterhorn of Garhwal) towering at 6500 meters. We will also see Bhrigu Parbat (6040 meters) in the backdrop of the valley. The trail gradually ascends above the treeline through juniper bushes and then through an extensive boulder field making the climb hot and dusty. There is a guest-house which remains booked during most of the season and an advance booking is essential. There is also a campsite beside the river and a small temple. We camp here tonight while enjoying the magnificent moon light views of the Bhagirathi Peaks. There are hot baths and good food available at the nearby guest house for a fee. Else free food is also served for Pilgrims at nearby Lal Baba's Ashram. We leave early today as the path leading to Tapovan from Gaumukh is difficult and its best to cross Gaumukh before noon. The first four kilometer would be on an easy flat trail and as the valley narrows down it turns over a grassy meadow a great place where pilgrims and sadhus throng for meditation during summers. From here the terrain turns rocky as we negotiate our way through rock and boulders down to a sandy beach which is also a great campsite. We will come across some eateries, where we can have refreshments and stock up some supplies before heading for Gaumukh. The trail leads us through moraine and sandy plains where Sadhus are meditating in nearby caves. The terrain becomes difficult until we reach the last leg alongside a river bank. Following the river bank we will reach the high glacial wall from where the river is originating from a snout which is shaped like mouth of a cow(hence the name Go-Mukh). Shivling Peak is visible from here standing vertical. Pilgrims get as close to the glacier to take a dip in the freezing waters and pay obeisances from up close to the source of the holy river. The trail to Tapovan starts 500 meters below the snout of the glacier from a terminal moraine, where it splits from the main trail after a 200 meter ascent. Climb up the northern side of the glacier and cross it on the opposite side of the valley negotiating through the rock and debris while still on the glacier. Once on the southern bank of the river valley, the path gets well defined. From here there is a steep climb of a thousand feet to the meadows at the base of Shivling Peak (6500 meters). We have reached Tapovan, which is a pleasant site, a grassy alpine meadow complete with bubbling streams, wildflowers and many camping sites beneath Shivling Peak, which sweeps up in a wave of scree, granite and snow. On the far side we can see Bhagirathi Peaks including Bhagirathi I (6900 meters). Basic accommodation run by Sadhus is available along with some eateries for convenience of pilgrims. We camp here at the meadows of Tapovan tonight on the base of Shivling Peak, shining in moonlight amid star studded skies. Feeling blessed with the once in a lifetime of oppurtunity to visit such a holy and spiritual paradise. Their is also a side trip to Lake Gandhava which is recommended if time allows. It is called the lake of the divine souls. It's an ascent directly above the meadow and takes less than hour but the views atop along the lake are well worth the effort. Thier is a Shiva Linga close the Lake, while the views back down towards Gangotri Glacier are splendid. Today we start early and after breakfast retrace our steps back downhill all the way till Gaumukh. From Gaumukh it's a flat trail till Bhojbasa. Where we can have our lunch and if time and energy allows, proceed for another 5 kilometers till Chirbasa where we can spend our nights on the banks of the river Ganga under star-studded sky. Today will be an easy day as it wont take us more than 2-3 hours to reach Gangotri where our cabs will be waiting to transport you back to Uttarkashi after lunch/refreshments in Gangotri.